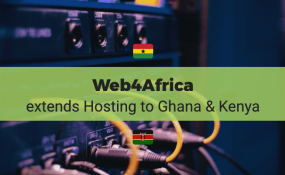 Web4Africa has further consolidated its position as a market leader in the Africa region by extending its hosting infrastructure to Ghana in West Africa and Kenya in East Africa. This brings the company data centre presence to 4 countries, including South Africa and Nigeria. The two new regions added by Web4Africa get to enjoy world-class local hosting services delivered by an experienced and established hosting company. Since the websites and data are local, residents of the respective regions would enjoy much-improved delivery should they choose to host with Web4Africa in their regions. Established in 2002, Web4Africa has grown and evolved into delivering world-class hosting solutions from its extensive infrastructure across East, West and Southern Africa. The solutions include Web Hosting, Virtual Servers and Dedicated Server Hosting. In each service, clients are able to choose from any of the 4 countries geographically closest to them, thus enjoying a lower latency and improved speeds for their website or app content. The Dedicated and Virtual Server offers come with flexible server specifications that can meet a wide range of enterprise hosting needs - running a wide range of Operating Systems including CentOS, Ubuntu Server, Debian, Scientific Linux as well as Fedora. The Virtual Servers are available with OpenVZ 7 or KVM virtualization technologies. Powered by best-in-class hardware, the regular Web Hosting offers come in 4 plans that meet a variety of Small / Medium scale business needs. This is in addition to about 450 easy-to-install scripts including WordPress, Drupal, Joomla etc. With extensive open peering in South Africa and Nigeria as well as through transit providers in Kenya and Ghana, Web4Africa enjoys direct connectivity to major IP carriers and Internet Service Providers in the respective regions and thus able deliver content locally and rapidly. Web4Africa also delivers traffic over IPv6 natively from all its data centre locations, thus making its IP network future-proof. Copyright © 2018 Web4Africa. All rights reserved. Distributed by AllAfrica Global Media (allAfrica.com). To contact the copyright holder directly for corrections — or for permission to republish or make other authorized use of this material, click here.